There are two movie icons of the ’80s you wanted to be if you were growing up back then: A Ghostbuster and Marty McFly. Not only is the latter one of the great character names in all of Hollywood, it’s one of the most memorable creations, despite being as average as they come. To be fair, there were a share of Doc Browns, the kid who sat in the back of the class tinkering with things, fixing them, or otherwise eating those things they shouldn’t. This connection could certainly explain the draw people have to this series, while the spectacular effects and imagination add to the charm. Oddly, you can find a small relationship between Back to the Future and Ghostbusters. The former has the iconic scene where famous dialogue like 1.21 gigawatts are first spoken, this just before the first instance of time travel is displayed on screen. The mish-mash of movie science, radioactivity, and and the energy of its characters falls right in line with Ghostbusters’ ballroom sequence. They accomplish the same thing, introducing movie audiences to a fantastical world where anything is possible, memorable characters, and the entertainment value (forgive the commonality) goes through the roof. Days, months, and years could be taken to discuss the nuances of Back to the Future’s time travel, and they have actually. The dawn of the internet sparked further debate about the glaring plot holes and respective questions brought up by the script. Short of adding a Terminator into the mix, it’s as geeky a debate as they come. But, without the passion of the fanbase, conversations like that don’t happen. Lesser films, the ones long forgotten, are passed over. Back to the Future is one of the quintessential time travel films, and even one of the greatest of all time travel stories, books, movies, video games, and TV shows included. 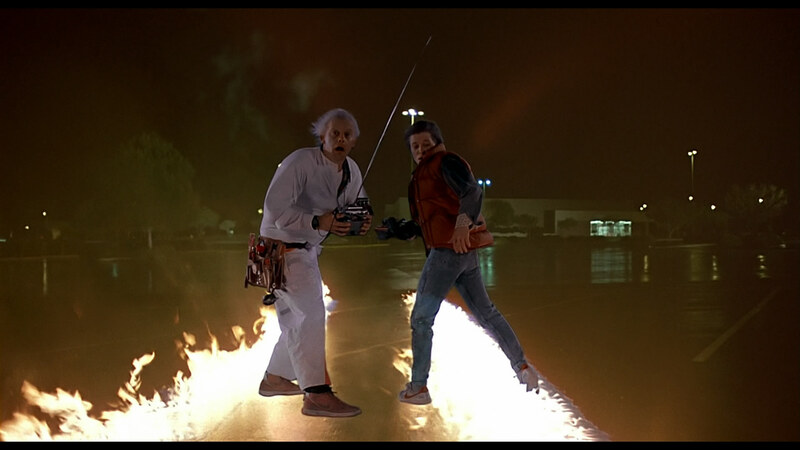 Without the character, the enthusiastic, panicky Doc Brown (Christopher Lloyd) or the terrified Marty McFly (Michael J. Fox), the film would be barren. It’s that section of storytelling Hollywood has forgotten, the needless array of computer graphics overtaking the more important elements, eliminating the Marty McFly’s of the world. They don’t exist anymore, as if Marty and Brown inadvertently altered Hollywood with their travels, ruining it for the rest of us in the modern day. So be it, because they brought us Back to the Future. Universal’s hi-def effort for Back to the Future is a wild disappointment, although not necessarily a lie. The box clearly states “digitally restored,” and that is certainly what Universal did here with this VC-1 encode. Digital is a term that creeps up far too often when watching this effort, the look of this transfer leaning generously in the direction of tampering, not film-like. The light grain structure is visible, although rather poorly resolved. A shot of Marty looking around town at 7:57 makes the grain move around his face in static fashion, like it’s stuck or simply compression. That’s hardly a surprise. The pale flesh tones, flickering car grills (and Marty’s suit at the school dance), and lackluster detail are all indicators something is amiss. The attention these films deserve for their HD premiere was not given. The DNR is slightly evident in close, the above issues the tell-tale signs of a light layer of manipulation, but the real test comes at a distance. Most of the offending shots occur when the camera pans out, shots of the various streets showcasing miserably defined foliage, and a shot of the teens at the dance at 1:29:41 pathetic. Close-ups reveal a second issue, this one of sometimes glaring edge enhancement. It comes in various flavors, from the familiar white halos to the black lines that outline people like cartoon characters. Loraine is covered with it at 1:04:59, while Marty’s arm holds a notable bit of sharpening at 1:46:58. Those are certainly brief examples, the film not quite lathered in edge enhancement, but it is a persistent problem. The effects of sharpening are always visible, if not always blatantly so, and in retrospect, it’s hardly the worst case of processing Universal has ever given us. If there are any complaints left, and the machine that generates them is running out of plutonium, there is some definite black crush on display. While the contrast is fine, quite natural compared to just about everything else, some low level crush dilutes shadow detail, as if the black levels are fighting back against the DNR to keep some of the detail to themselves. This is certainly the least of the disc’s issues. Positives? Sure. Colors are elevated, Linda’s pink shirt at the dinner table so vivid it leaps off the screen compared to the warmer hues lighting the scene. Outdoor scenes carry plenty of pop, from the movie theater sign to the clothes. It certainly seems to be trying to make up for its lesser elements. There is an increase in detail too, the light DNR unable to wipe everything from the frame, so some close-ups are fairly satisfactory. Lorraine and George’s first kiss is shot in tight close-up, some genuine facial detail cleanly resolved. Christopher Lloyd’s make-up is also evident in some shots, disappearing almost entirely when zoomed out. The movie deserves better, as do all films. If the Evil Dead Blu-ray can look like like it did (no budget and 16 mm be damned), why can’t Back to the Future? Alan Silvestri’s timeless score is preserved wonderfully by this DTS-HD mix, seemingly free of any overt, miscalculated manipulation. The music is pure, clean, and free of problems, carrying some fine weight and clean highs. It also bleeds into the surrounds effectively, although maybe not quite with the aggressiveness of Huey Lewis and the News’ “Power of Love.” That nearly overloads the soundfield, a bit unnatural and pumped in the surrounds. The same could be said for the performance at the dance, Marty going to town on the electric guitar with force, the echo bleeding heavily into the rears. Everything involving the band sounds a bit elevated, the surround push aggressive and forceful, a bit out of character for this presentation. Everything else carries a fine balance. The DeLorean whizzes by the screen and cleanly into the surrounds. The actual move into time delivers a jolt of bass, not the tightest low-end work ever produced on the format, but enough to jolt the viewer and get the point across. Thunder and lightning dots the finale, zipping around front to back as the visuals demand. Other vehicles, like the Lybian nationalists as Marty first arrives back in 1985, splits the stereos well. It’s effective. Dialogue is a bit muted and flat, more noticeable at times than others. That’s to be expected. There are no serious issues, which could range from hiss to popping. It’s balanced well, which is key. Universal has no doubt put together a wonderful extras package here, each film given a fairly lavish treatment with plenty of new material to go around. There are two commentary tracks here, a Q&A with producers Bob Gale and director Robert Zemeckis up first. The second is your general commentary, given by Gale and Neil Canton. These are followed up by some deleted scenes, eight in all, that run nearly 11-minutes. Tales from the Future is a making-of that will carry over into all three discs, the first sub-section per se called In the Beginning detailing how the film came about, the second Time to Go moving into production, the third Keeping Time focused on the music. A section of archival featurettes all carry a wildly incorrect vertical aspect ratio, an ’80s making-of starting this off, followed by the first part of another three-disc documentary, Making the Trilogy. Back to the Future Night takes us back to when movie premieres on TV where a big deal, this one hosted by Leslie Nielsen on NBC. An interview with Michael J. Fox is the next option in the menu, a 10-minute sit-down chat. A section on behind-the-scenes covers outtakes, make-up tests, and a deleted concept for a nuclear site sequence with a commentary. U-Control support offers trivia, a storyboard comparison, and another that focuses on themes and little additions that connect the series together. A music video, trailer, and D-Box support are left.